When you're towing a travel trailer on open the road, drive like your grandmother would. All of your normal bad driving habits are amplified when you're towing a camper. Leave your regular "late for work" self at home when you head out on vacation. Adopt an over-cautious attitude for piloting your little big-rig. You won't be able to lead-foot it when the light turns green anyway, so change the rest of your approach at the same time. Furthermore, even with electric brakes on your trailer, your braking distances will be significantly magnified. If your truck or van offers a special towing gear-ratio, be sure to select it. Your camping trailer can double the weight-load on your transmission. Slow, smooth acceleration will reduce wear and tear on your vehicle and save on expensive repairs later. Never tailgate when you're towing, no matter how good your brake system might be. Allow for longer stopping distances and lower turning speeds. On the highway, forget the fast lane and the supposed buffer-zone above the speed limit. Long uphill or downhill runs call for even more caution. Bad weather makes towing even more dangerous. You may want to consider taking a break from driving if heavy rain or high winds overtake you. Your risk of hydroplaning is higher, due to your camper's basic tires and poor handling characteristics. Never drive after drinking, even a little. If you're tired, it's time for a different driver or a stop for the night. All of the "minor" inconveniences you feel you can overcome in ordinary driving conditions can lead to extreme consequences for you and your camper. Don't risk it - always err on the side of caution. When you tow a travel trailer, you are a menace to the other drivers around you. It's not your fault; it's just a fact. 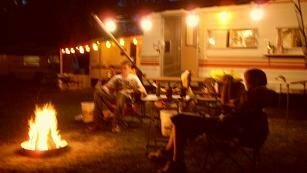 Camping trailers are wider than all but the largest passenger vehicles, and taller than all of them. They block the view of drivers following directly behind. Heaven forbid your brake lights fail to function properly. If you are towing a camper on a two-lane road with limited passing, you WILL pile up other vehicles behind you. Typically, the closest driver will be invisible to you, even if you have wide-view side mirrors. Why do car drivers follow towed rigs too closely? Perhaps it's human nature and impatience. Travel trailers are heavy and cumbersome; nobody wants to get stuck behind yours. Since your tow vehicle and trailer are much longer than a single car or truck, you are more difficult to pass even under the best circumstances. This puts the burden of road courtesy on you. Watch for a developing line of cars behind you. Be considerate. Your slower acceleration and longer braking distances, combined with your need to more closely adhere to the speed limit, will lead to lines of cars behind you. Accept it, and act accordingly. If the coast is clear and passing is allowed, move slightly to the right and slow down just a bit. No need to wave followers around you - they'll get the hint. Take advantage of uphill "slow lanes" and let faster vehicles get past you safely. Reprinted from the original hosted on Helium. Copyright 2009 -- Jim Bessey, all rights reserved. Would you like to win a free pair of Motorola Talkabout Portable Radios? See our Giveaway Post for all the details. I agree to you Irene. This article will improve their safety on the road. This will be a big help to us. Thanks for sharing. Towing is not as easy as it seems specially when you deal with massive things. That is helping I guess, people who happened to wallop in this post will have a change to get knowledge of the process in good manners. To deal with this kind of procedures you should know the best safety tips. Thanks for sharing this piece of work because bland knowledge can cause serious safety risks. This was really good. It is going to make towing in MT. Gilead a lot easier now. I just purchased my first RV which is in good condition but in need of tlc. I have good ideas to decorate the space with but hesitant to make too many changes to the space. Thank you for sharing. The pictures are a great inspiration. I'm so impressed by all the work you put into this! Where can I find some good towing in Surrey to help get my car out of the snow? This is the tips we need for safe towing, thanks for the post. Great and helpful tips for travelers like me. A fun and memorable camping experience must begin with safety on the road. Make sure to purchase only the high standard camper trailers. 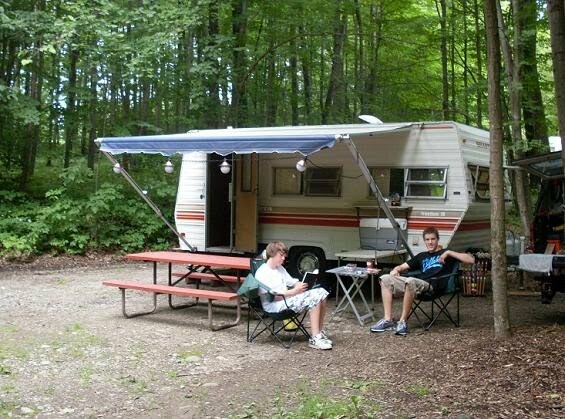 To help you choose the trusted campers, check out these Camper Trailers Tips. Any advice? We are towing a 30 ft. TT 10 miles down the bypass. Winds are predicted 17 mpr. We are bare ball and no sway bar but going no more than 50 mpr to tow. Is this too chancy? You should probably include a follow-behind Caution Car, Sherry. Without an anti-sway bar you may find that you have to slow to 40 mph in much faster traffic, so having a second vehicle behind to keep an eye on your tow and warn following drivers (use flashers) would be a smart move. Good luck! Thank you for the wonderful blog. It is indeed informative and useful We are into the same business. For know more about us, please visit Camper Trailers today. Great tips to ensure safety while towing. I just love what's been said: "When you're towing a travel trailer on open the road, drive like your grandmother would." If you're being cautious when driving a normal car, you need extra precautions when pulling a trailer. If you can tow a vehicle safely, then I believe you must be a great driver! And also, one shouldn't forget to secure or install a towbar for increased safety. Wow! This is a very useful page and I really enjoyed reading article and all users’ comments. RV trailers offers best selection of Pre-owned RV’s priced to sell. We carry wide selection of Pre-owned Class A Gas, Class A Diesel, Class B, Class C, Campers, folding Trailers, Truck Campers, Travel Trailers, And 5th Wheels. Super Deals RV sales is small dealership with lower overheads and best prices and we are committed to making every customer happy. Thank you for sharing valuable information. Mу pаrtner and I absolutely love уour blog anԁ finԁ а lot of your post's to be exactly what I'm looking fοr.Doеs one offer guеst writers tο writе cоntеnt to suit уоur needs? I've been looking at getting an RV and one of my concerns has been towing a trailer. It good to know that your chances of hydroplaning are higher when you are towing a trailer. I'm going to have to take that risk into account when buying and towing my trailer. I also didn't know about the chances of hydroplaning when towing a trailer. That's good to know. Thanks for this information. Calling a towing service is not actually a difficult task. The most challenging part is to determine which among the many towing companies can provide you with the best service that you need the most especially during emergency situations. You should choose a company that is available 24/7.